Our examination of the Rochester city checkbok registry discovered political spending on advertisements and events. Elected officials raise and spend money throughout their terms. Not all campaign spending involves explicit messages to elect a candidate. Politicians also use campaign dollars on nonprofit events, advertisements and causes. This spending influences their standing in the community. For example, if a state assemblyman sponsors a church anniversary luncheon, the congregation will be thankful for his support and possibly more inclined to offer support at the polls. Spending from political funds constitutes political activity. It’s against the law to use taxpayer resources for political activity. Such conduct can lead to criminal charges. Our analysis of city spending has uncovered strong evidence that city resources were used to produce political ads paid for by Warren’s campaign, Friends of Lovely Warren, and political action committee, Warren for a Stronger Rochester PAC. While reviewing Warren’s political expenditures, we discovered a December 2015 Chanukah ad in the Jewish Ledger that was paid for by Warren for a Stronger Rochester PAC, but looked like an official city communication. It had the mayor’s official portrait, city logo and city graphic design template. We filed an open records request with the city for all communications related to the ad. The city gave us an email from a communications staffer sending the artwork to the Jewish Ledger. Meanwhile, another open records request confirmed there was no check or invoice from the city for this ad. This appears to be evidence that city resources were illegally used to create and place this political ad. Suspecting there were other political ads produced using city resources, we filed an open records request for all materials produced for organizations that received political funds from Warren for print ads. The city provided other ads that may have been paid for using political funds, but the dates didn’t quite line up and the organizations also received checks from the city. This was given to us by a city employee. 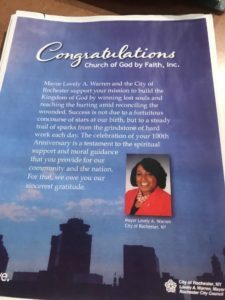 We believe the city should also have provided an ad for Church of God by Faith, Inc. A city employee, disturbed by the ad’s religious content, gave us a copy found on the city server dated January 2015. Friends of Lovely Warren paid the church $100 for a print ad in October 2014. The dates don’t quite match, but we couldn’t find a check from the city to the church. A full investigation by authorities would be needed to determine the extent of what appears to be illegal conduct. The city does not appear to have a wall between political spending and taxpayer spending. For example, after Warren for a Stronger Rochester PAC’s purchase of the Chanukah ad in 2015, the cost of Jewish Ledger holiday greetings shifted to taxpayers. How did the same ad qualify as political one year, but not the next? There should be strict rules governing this type of spending. Other local politicians, including Governor Andrew Cuomo, Assemblyman Joe Morelle, State Senator Joe Robach, Brighton Town Supervisor Bill Moehle and District Attorney Sandra Doorley use campaign dollars for Jewish Ledger ads. Warren appears to be coordinating the spending of tax dollars and political funds for the same organizations and events. Again, there doesn’t appear to be a line between political and taxpayer spending at City Hall. The 2016 Distinguished Gentlemen The Mayor’s Appointment event was funded by Warren for a Stronger Rochester, which paid for the space at the Blue Cross Arena. But taxpayers paid $300 for youth to rent tuxes and for a staff photographer to take pictures. There’s no record of Warren’s political funds paying for the Distinguished Gentlemen’s event in 2017, but the city again paid $300 for tuxes and for a staff photographer to take pictures. We have asked if the cost of the entire event shifted to taxpayers in 2017. The city’s official photography page and website features the events. Warren for a Stronger Rochester paid for the Carlton Wilcox Live Band to play at an unspecified reception on May 2, 2017. The city hosted a reception with the band for Deputy Mayor Cedric Alexander in the City Hall Atrium the same day. Warren’s annual Thanksgiving meal giveaway blurs the line between political activity and official city business. The event is funded by Friends of Lovely Warren, not taxpayers. This fact is not included in media stories; one outlet reported the event was hosted by the city. It’s understandable why the media got the wrong impression, as city staffers are present at the events, which are held on weekdays.The mayor’s city-produced Thanksgiving video in 2017 had photos from the event. In 2016, the city’s official Twitter account promoted the turkey giveaway. Because the political funds don’t list the purpose for many of expenditures in their Board of Elections filings, it’s likely there are other political events that used city resources. If political dollars are funding an event, does that make it a political event? Is it legal to use city resources on events funded by campaigns? Is it legal and appropriate to shift political spending to taxpayers? How were these expenditures coordinated at City Hall? For example, who booked the band for the deputy mayor’s reception and decided how it would be funded? Who directed city staff to produce campaign ads? Our review of Warren’s campaign spending showed a small group of City Hall employees, including the mayor herself, operate the political action committee and campaign funds. The City of Rochester has a budget of $526 million. Much of that spending takes place out of the public view. There are no line items in the annual budget book for expenditures such as catered lunches or baseball tickets. City Council doesn’t vote on all business grants and loans. A good way to examine spending – which adds up quickly — is to obtain the city checkbook registry. Through open records requests, we analyzed the city’s checkbook registries for the final years of the Robert Duffy and Tom Richards administrations, as well as all four years of Lovely Warren’s first term. This process took months, as the registries contain a combined total of nearly a million checks. We flagged about 150 expenditures and filed open record requests for further information, such as invoices, receipts and contracts. Citizens have a right to know how their tax dollars are spent. They have a right to expect prudent use of tax dollars. They have a right to demand the highest ethical standards. Transparency is the best means to accomplish these goals. “Wait your turn”. Who’s turn is it next in Corruption Junction?